AAAH! I am so beyond behind on reviews and memes and pretty much everything else I do on my blog. I had SO MUCH FUN organising my blogaversary, but now that it is almost over *cries buckets of tears* I figured it's time to start catching up, on some of them. Blurb Description: They sound like the Bad Guys, they look like the Bad Guys . . . and they even smell like the Bad Guys. But Mr Wolf, Mr Piranha, Mr Snake and Mr Shark are about to change all of that! Mr Wolf has a daring plan for the Bad Guys first good mission. The gang are going to break 200 dogs out of the Maximum Security City Dog Pound. Will Operation Dog Pound go smoothly? Will the Bad Guys become the Good Guys? And will Mr Snake please spit out Mr Piranha? I’ll be supremely honest, it’s been a really long time since I read a kids book for me. I mean, I’m SO OLD at the great age of seventeen, the zenith of my wisdom, and which seventeen year old reads a book targeted for someone younger than her, right? After all, as my mother oh-so-kindly tells me, all us seventeen year olds look twenty and act twenty five, and the race to be an adult is ON! In fact, the only time I find myself reading kids’ books is when it is to my little cousins, and the one that is still interested can do it by himself now, so you see how the story of Aditi and The Children’s Books has taken a stop in non-existent land. 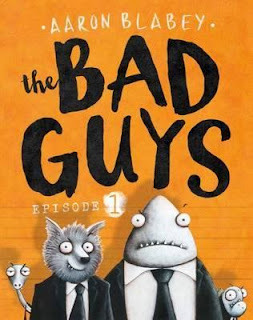 And then Scholastic India gave me the opportunity to read Bad Guys and after hearing nothing but great reviews from ADULTS, I decided to try it out. After all, I had nothing to lose and possibly a new book to gain. And let me tell you, taking a chance on Bad Guys REALLY paid off. For the whole fifteen minutes it took me to read and appreciate this book, I had the SILLIEST smile (not to mention the manic laughter) playing on my face. This book was funny, unconventional and the perfect light read to de-stress on a stress filled day. Mr. Shark (WARNING: EATS EVERYTHING) – who are COMPLETELY sick about being villains and how they change it. And it had me falling off my seat in laughter. A PERFECTLY written and illustrated novel for the child in every one of us. 5 STARS!